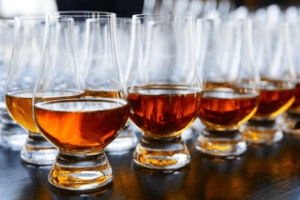 This guide will teach you about the different fractions that occur within a pot still distillation and how and when to make cuts thus allowing you to control the end flavor and quality of the spirit. Cuts are predetermined points during a distillation run where a stiller will separates product coming from the still into separate containers. The end result is several different jars of product. Each having an individual flavor and abv. 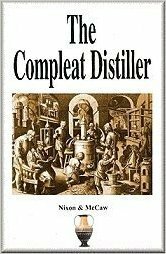 How to know where to make cuts during distillation run ? In order to determine where to make cuts when distilling you need to understand the different fractions of a run and learn how to recognize them during the distillation. Fractions are the individual components of a mixture of compounds that can be divided during phase transition. In our case fractions can be separated during the distillation process. You can identify fractions using either still head temperature, by abv % or by taste this comes with experience. In any case once you learn how your still performs identifying fractions becomes predictable. Also keep in mind that during distillation still temperature rises and abv drops, they are directly related to each other and are an indication of what is coming out of your still. Below is a list of compounds present in your wash and their specific boiling points. This gives you an idea at what temperature certain alcohols start to vaporize from the wash. When distilling with a pot still it is often desired to make several stripping runs before doing a final product run. This saves time and makes blending easier. If your interested in learning more about how to distill a stripping run check out Fundamentals of Distilling A Stripping Run. What are the main Fractions that occur during the distillation of moonshine ? Foreshots – The foreshots fraction is the first to be collected during the distillation process and contains a large percentage of acetone. Don’t even think about drinking this stuff. Generally during a pot still run we’ll allow for 150 ml per 25L of wash for our Foreshot Fraction. This get’s tossed down the drain. Foreshots can start coming from the still at 50 C.
Heads – The Heads Fraction is a mixture of acetone, methanol, ethyl-acette and ethanol. You can expect the heads fraction to smell slightly sweet with a solvent like sting to it. It’s common practice to separate the heads and add them to the next distillation run as they contain a large amount of ethanol. General practice is to take 750 ml for Heads Fraction after Foreshots. You can take more or less personal perforce plays a big role in this decision. 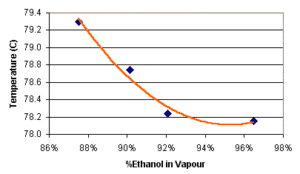 Hearts – The hearts fraction contains the highest percentage of ethanol and will have a very clean taste lacking the bite of the heads. It can be collected between 78-82°C or if you prefer abv between 80 -50 % with low wines of 40%. When blending fractions to make your final product the Hearts are the base of your product. Tails – The Tails fraction contains large amounts of fusel oils which cause unwanted flavors in your product. The tails can be identified by the distinctive smell of wet dog. Fusel oils aside there is a substantial amount of ethanol and rich flavors in the tails that are often desirable if you are making a rum or whiskey. These flavors can be extracted by doing a feints run. The feints run will yield a very flavorful product that can be used when blending the Hearts fraction. Collection of the tails can be ended when still temperatures reach 94 – 95°C or abv reaches 20% with low wines. If your a newbie distiller and are just learning how to make cuts I’d recommended making the main cuts between heads to hearts, and hearts to tails. Get comfortable with this first before you move on to blending. If your comfortable with making these initial cuts then check out the Blending guide for Newbie’s. It will walk you through the process of blending whiskeys and rum for first timers. 9 Responses to "A How To Guide To Cuts and Fractions – Pot Still Run"
Great Website and articles! I just bought a 20L Still and it came with 3 top cannisters, a lower one with a drain port for Fusel oils, upper flavourong cannister and then if course the cooling cannister with the water inlet and outlet ports. When im making cuts, what can I expect to come out of the fusel oil port? Will the heads drain from here? I’m just unclear on what to use the fluid collected from this outlet. I understand tossing the 150ml of heads but will a portion of the heads also come out of this fusel oil port or is it going to be just fusel oil to collect and possibly use on a future blend? Can you send me a link to the still you purchased ? Want to have a look at the design before I advise you ! To be honest I’m not sure about that “Sink fraction” drain. Have you run a batch in it yet ? Could also be a clean out port for the lower chamber or safety valve to keep pressure from building up in the lower chamber of the still . They got some pretty funny labels on that cut away, guessing it’s straight from china ! Might buy one just to pull it apart and see what’s going on in there. Ya it’s a neat little rig. 5 gallon. I’ve only ran the vinegar water through it and collected more fluid out of the sink fractions port than out of the kick line. But i didnt have the condensing coil cooling either as i was advised not to on the vinegar run. I’ll be doing a stripping run this weekend. 10 gallon to strip so I should have it figured out, just be trial and error. Was thinking i might have to add a shut off valve on the sink fractions line if it continues to leak more fluid than the actual kick tube. Its built in Russia btw, and those guys like their booze so im guessing its gonna work! This is the one I purchased. I”m guessing not much will come out of that sink port/fussel oil port except nasty throwaway fluid, similiar to the Foreshots but out a different port? I have a pot still. When doing a spirit run after several striping runs, will the spirit run yield mostly ethanol? Does the alcohol content decrease the longer the brandy is being distilled? I had 8 pints of wine and distilled about 600 ml at about 60% and then the alcohol level in the next wine was dropping to 40% and getting lower. How much wine should be left in the potstill when it is considered finished with and has this wine had all the alcohol extracted from it?